Following an intervention by parliamentarians, Iranian human rights lawyer Nasrin Sotoudeh ended her 49-day long hunger strike on 4 December 2012 after the travel ban on her 13-year old daughter was lifted by Iran’s judiciary. Her health is frail due to her prolonged hunger strike and she needs specialized medical care. Amnesty International is calling for her immediate and unconditional release. Prisoner of conscience Nasrin Sotoudeh, ended her 49-day hunger strike after judicial authorities agreed to meet her demand to lift a travel ban imposed on her 13-year-old daughter. Reza Khandan, Nasrin Sotoudeh’s husband, and a number of women’s rights activists met with parliamentarians regarding her case. Emerging parliamentary concern, expressed following this meeting, appears to have prompted judicial officials to lift the restriction. A member of the parliament’s National Security and Foreign Policy Commission has also stated that a number of parliamentarians plan to visit Evin Prison. On 2 December, Reza Khandan reported that Nasrin Sotoudeh’s health had deteriorated and that she was suffering from loss of vision, dizziness, unsteadiness and low blood pressure. It is unclear whether she has access to a diet appropriate to someone coming off a prolonged hunger strike. Urging them to obtain assurances from prison officials that Nasrin Sotoudeh is being given full access to the specialized medical treatment required for those who have not had food for prolonged periods, including access to independent doctors of her choice. The judicial order to lift the travel ban on Nasrin Sotoudeh’s daughter followed months of campaigning at both national and international levels. At the same time that Iranian MPs raised concerns with judicial officials in Iran, on 4 December, Navi Pillay, and the High Commissioner for Human Rights expressed her concern about Nasrin Sotoudeh, urging the Government of Iran to promptly release her along with all other activists who have been arrested and imprisoned for their peaceful human rights activism in Iran. Amnesty International urges Iranian parliamentarians to continue to fulfil their responsibilities to uphold the human rights of their constituents whether through amending national legislation and policies or at an individual level. Nasrin Sotoudeh started a hunger strike on the morning of 17 October 2012 in protest at the authorities’ denial of her repeated requests to have face-to-face visits with her 13-year-old daughter and five-year-old son. She was transferred to Evin Prison’s clinic on 26 November and was told that she must have checkups there every day as her blood pressure was very low. According to her husband, Reza Khandan, she drank only salt-water and sugar-water since the start of her hunger strike. Nasrin Sotoudeh was transferred to solitary confinement in Section 209 of Tehran’s Evin Prison, under the control of the Ministry of Intelligence, on 4 November, in what appeared to be a punitive measure. On 15 November, Reza Khandan reported that when he tried to visit her in Section 209, the authorities told him she was not there, though they had previously told him that she had been transferred there from the General Ward. 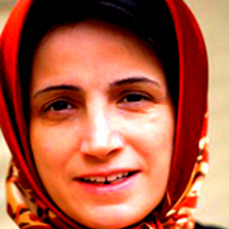 Nasrin Sotoudeh’s whereabouts were unknown until she was transferred back to the General Ward on 21 November. Nasrin Sotoudeh was restricted to family visits in a "cabin" (behind a glass screen) after the prison authorities discovered she had been writing a defence for her upcoming court hearing on a piece of tissue paper. She has not been allowed to make phone calls for the past year. On 12 November Nasrin Sotoudeh was allowed to have a face-to-face visit with her children. The meeting lasted only a few minutes and was in the presence of the prison guards. Reza Khandan was not allowed to meet her. Nasrin Sotoudeh told her family that she would continue her hunger strike until the authorities lift the travel ban imposed on her 13-year-old daughter. In July 2012, Reza Khandan and their daughter received an order informing them that they were banned from travelling; this appears to have resulted from a case that had been opened against them. On 9 January 2011, Nasrin Sotoudeh was sentenced to 11 years in prison by Branch 26 of the Revolutionary Court for “spreading propaganda against the system” and “acting against national security”, including membership of the Centre for Human Rights Defenders (CHRD)..Nasrin Sotoudeh's sentence was later reduced to six years on appeal. She has denied all charges against her, including membership of the CHRD. She was also banned from practising law and travelling for 20 years, reduced to 10 years on appeal. Since her arrest on 4 September 2010, Nasrin Sotoudeh has been detained in Evin Prison, including a lengthy period in solitary conﬁnement. Her health has been weakened by three previous hunger strikes in protest against her arrest and detention conditions. The UN Basic Principles on the Role of Lawyers provide that lawyers must be allowed to carry out their work “without intimidation, hindrance, harassment or improper interference.” In addition, it affirms the right of lawyers to freedom of expression, also provided for in Article 19 of the ICCPR, which includes “the right to take part in public discussion of matters concerning the law, the administration of justice and the promotion and protection of human rights”. Greetings from IWRAW Asia Pacific! It is the 10th of December once again and we would like to wish you all a Happy Human Rights Day! The theme this year - My Voice Counts –reminds us about the guarantees in the UDHR on freedom of speech, thought, belief and the right to participate in public life and impact policy and decision making. It acknowledges and respects each individual’s voice and helps us to remember that it is about the person no matter our differences and that there are those of us whose voices are silenced or ignored because we lack the political power to make ourselves heard. Yet it implies so much more in terms of vision: it speaks towards a world of inclusion, diversity, respect for difference of opinion, free and open social debates, right to collective action and the recognition of the legitimate role of CSOs and NGOs in public policy and social change towards equality, non-discrimination, justice and peace, the right to take part in politics and hold office. In the past year, we have seen numerous attempts to silence women’s voices, including the heartbreaking but ultimately inspiring story of Malala, a young girl nearly killed for expressing her right and the rights of young girls to education. For women, marginalisation and exclusion from representation and decision-making, spells danger and risk to their individual freedoms and collective rights. Examples have shown that exclusion of gender perspectives and obstacles to women’s participation in public and civic roles negatively impact democratic principles, good governance and rule of law. Women’s demands for equality in the family and in the workplace, and struggles to end domestic violence and sexual harassment at the workplace, recognition of the separate reality of women, need to be heard and acted upon by governments, society and private actors. To pursue gender equality, it is important to ground and socialise the culture of international human rights norms, including an appreciation for the principles of substantive equality and non-discrimination established by the UN Convention on the Elimination of All Forms of Discrimination against Women (CEDAW). The ability to articulate these will strengthen their demands for equality, justice and recognition as a cohesive, political constituency; grounded ideologically in principles of democracy, peace, respect for rights and being knowledgeable in the practice of citizen governance. We can celebrate the fact that CEDAW nears universal ratification with 187 ratifications, and further ratifications of its optional protocol (OPCEDAW). The CEDAW state dialogue process and the OPCEDAW mechanism is a way for women’s voices to be heard by their states and supported by the global standards practices of the member states of CEDAW articulated by the recommendations of the CEDAW Committee and challenges states to prioritise and act in compliance with international law to address violations to women’s human rights. 64 years ago, this day would have been celebrated very differently. But today, we are lucky to have successes that we can commemorate. It is a good time for all of us to reflect on the good and the bad and continuously challenge ourselves to think of creative and innovative rights-based approaches to achieve our human rights goals to have a better future together. In the coming year IWRAW Asia Pacific will undertake efforts to strengthen women’s voices in public policy and decision making through specific projects including one to strengthen the voices of young feminists in Asia Pacific, supported by the UN Women Gender Equality Fund. On this day, IWRAW Asia Pacific congratulates and thanks courageous men and women who have fought and are still fighting for the right to express our thoughts and feelings about the world and who fight for the rights and freedoms inherent in our shared humanity. We raise our voices in support of this struggle – We are WOMEN and Our VOICES COUNT! We are very excited to announce that we will be hosting our 7th Women’s Institute on Leadership and Disability (WILD) in August, 2013. As you know, WILD will bring together approximately 30 women leaders with disabilities from 30 different countries to strengthen leadership capacity, create new visions and build international networks of support for inclusive international development programming. The deadline to apply is January 13, 2013. WILD is a very competitive program and we receive a very large number of applications for limited spaces. Therefore, applicants are encouraged to apply early. Also, applications for WILD 2013 will be available in Spanish, French and English (NOTE: Spanish and French applications will be available on December 3). Thank you for disseminating far and wide so that we can recruit the next generation of “WILD” women! Celebrating 31 years of empowering people with disabilities to achieve their human rights through international exchange and international development.